Framed and Stretched, Ready to Hang. Gallery wrapped on 1.3" wood bars,More Strong, More Stable,and Better Quality. Each panel has a black hook already fixed on the wooden bar for easy hanging. 100% Hand-painted oil painting on canvas by professional artist. The animal pictures show online are taken from actual artwork which are made from our studio. 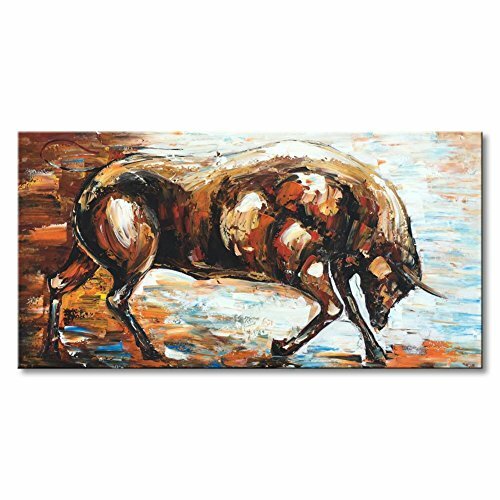 This bull animal canvas wall art suitable for wall decor, home decoration for living room, bedroom, office, dinning room, kitchen, hotel, bathroom, bar etc.